Took Dad to an eye doctor appointment today. The eye doctor place lets us wait in the car until they’re ready for us. This gives Dad and I a chance to talk in a quiet space. Karen: Dad, you’re going to be 101 in a couple months. Dad: (Nodding.) How old are YOU going to be? Karen: I’m going to be 63 in September. Karen: (Laughing.) I know, right? Isn’t that crazy?! Dad: How can that be?! (Thinking.) Time goes faster the older we get. Dad: (Thinking this might be a trick question, I guess.) The lines appear to be straight. Karen to Dr. Saperstein: That was Dad’s special mountain-climbing handshake. He knows you’re a mountain-climber. Dr. Saperstein: My climbing is nothing compared to what your Dad has done. (He looks at me and grins.) In fact, my climbing is nothing compared to what YOU have done. You’ve climbed a lot more mountains than me. Karen: (Laughing, and kind of embarrassed. I guess I HAVE climbed a lot of mountains – Rainier, Baker, Adams, Hood – but…I don’t know that I’ve ever really thought of myself as a climber.) I just followed Dad up the mountains and then followed him back down. Dr. Saperstein: (Laughing.) Well, you’ve done a lot more climbing than me. (He looks at the photos of Dad’s eyes.) His eyes look good. We won’t have to give him a treatment today. Let’s plan on seeing him again in three months. I help Dad out to the waiting room and help him sit in a chair. I tell him I’m going to make another appointment for him and then we’ll go and get him a root beer float. He nods. He thinks a root beer float is a good idea. After I make our next appointment I help Dad up and we begin our slow journey to the door. I let everyone in the waiting room know that Dad will be 101 in a couple months. They are impressed – and I feel them sending Dad their support as he works his way towards the door. “Dad’s a mountain climber,” I say. “He’s in Wikipedia. K2.” I can see that at least one of the men in the waiting room knows what “K2” is – his eyes get big and he smiles a big smile. He says he’s honored to be in the same room with Dad. I’m incredibly relieved when Dad has finally reached the car. At the end it looked like he might collapse – but he made it! Step by step – never giving up. Dad: Let’s go find a place with a root beer float. Dad: (Looking out the window.) The Skagit Delta. Beautiful country. I pull into the Sisters Espresso parking lot. Karen: Do you remember this place? Dad: (Nodding.) I’ve been here many times. I order him his float. When I bring it to him he smiles and says thank you. I head west – stop for some eagle pictures, and then drive by daffodil fields. Karen: Daffodils! Aren’t they beautiful?! Eventually we end up back at Dad’s home. I park in front of the door. Karen: Do you know how much I love you? I help Dad out of the car and reunite him with his walker. Dad: (Looking at the house.) Do we know these people? We help Dad up the stairs. Today he chooses to go right to his bedroom. He’s ready for a rest. Karen: Thank you for the drive today, Daddy. Dad: Thank YOU for the drive. Dad is in his recliner in front of the television when Scott, Dave, and I arrive. Dave: (Gives Dad a hug.) Hi, Dad. Dad: (His eyes light up.) Hi, David! Karen: Do you want to move to the dining room table so we can talk? Dad: (Situated now at the table.) I’ve been watching Pete (his son, my other brother) play football. He’s always in someone else’s jersey, though. His name is never on his jersey. Did you watch the Cougar-Husky game? Dad: Were you rooting for the Huskies? Karen: I went to WSU, so I was rooting for the Cougars. They lost. Your Huskies won. But it was a really good game. Dad: (Thinking.) I’m ready to leave here. Dad: You’re always saying this is my home. This isn’t my home. I have three homes near the Canadian border. Karen: And this is one of them. This home is near the Canadian border. Karen: And I live 15 minutes from here. Karen: Don’t leave here because then none of us would be able to find you! Scott: (Smiling.) Yeah. Don’t go anywhere. We like having you near us. Karen: (The white cat, Skittles, has jumped up on the table and is going from person to person for a pet and scratch behind the ears.) And Skittles the Cat, is here. She sleeps with you. She loves you. She would miss you not being here. Dad: (Nodding.) Yeah. She’s my little companion. David talks with Dad about the move he’s going to be making from Boise to Olympia in a couple weeks. Dad nods and smiles when he understands Dave will be closer soon. Karen: We brought you over for Thanksgiving a couple days ago. Do you remember that? Dad: (Nodding and smiling.) Yes. Karen: David’s kids, Claire and Casey were there. And Andrew and Xander. And Claire’s husband, Michael, and Casey’s girlfriend, Alex. Dad: (Nodding.) Yes. Your children are good people. And my children are good people. Karen: And we have a good father. David: (To Dad.) In seven months you’ll be 101. Karen: Do you remember when we brought you to Mount Rainier for your 100th birthday? Dad: (Nods.) Yes. (Thinking.) Kenny Foreman was there. Karen, David, and Scott: Yeah! That’s right. Karen: And Rick and Jana Johnson. We stayed at their place. Karen: I don’t know if we’ll be able to get back there for your 101st birthday, though. Dad: (Nods in agreement.) Yeah. That’s too far to go. Karen: But we’ll do something to celebrate. David: Can you sing the Dutch Christmas song? Dad: (Singing.) Sinterklaas Kapoentje, Le waat in mijn schoentje, leg waat in mijn laarsje, Dank je Sinterklassje! Karen: It’s time for us to take David to catch his shuttlebus now. Dad nods and gets up. We help him back into his recliner in front of the television. Megan has brought in a bowl of cheese balls for Dad. Dad: (Seeing the cheese balls.) Oh! I love these things! We give Dad hugs and tell him we love him and Dave says he will see him again soon for Christmas. Dad nods and smiles. He knows Christmas is not far away. Dad (Dee Molenaar) and David Molenaar in conversation. Okay – Are You Taking Me Home Now? : Adventures with Dad is back in stock. The editing never seems to end with this one – I’ll think I’m finally finished and then I notice that I repeated myself or I didn’t put a space where there should be a space or I used the wrong tense. I’ve been feeling a little discouraged – and then the book got its first review! Five stars! Check it out! (And I didn’t even pay him! ) Bless Dr. Bill. Karen: Daddy, do you want to go for a drive? Dad: Thank you for taking me for a drive. You’re a good daughter. Dad: Do you prefer to call me “Dad” or “Father”? Dad: Oh good! This is exactly what we need right now! Dad: This is the longest time I haven’t seen Mom. I think she’s in Kansas City… or somewhere in the Midwest… helping the government. Karen: I know she’s doing a good job. Dad: I used to do water rights surveys out here when I worked for the USGS. Karen: That was a fun part of your job, wasn’t it? Dad: Yes. I always took little detours when I went on these survey trips. (He looks around and studies the landscape.) This is a beautiful part of the world. Dad: I wonder how many places are called Fairhaven. It’s a good name. It has a happy sound to it. Dad: Are we going to park here and walk around? Karen: There’s no parking today. We’ll try to do that another day. As we’re driving up from the park I spot my old friend, Darryl – Darryl and I made acquaintance on the boardwalk several years ago when we saw each other taking photos and struck up conversation. In the course of our conversation we’d realized that Darryl’s Aunt Gladdie was one of Mom and Dad’s good friends. I stop and roll down the window and introduce Dad to Darryl – and try to explain that Darryl’s aunt is Gladdie. Dad is profoundly hard-of-hearing and I wasn’t sure he understood what was going on, but he smiled and shook Darryl’s hand and we moved on. A minute later he said, “Was he related to Gladdie in some way?” I told him he was Gladdie’s nephew. Dad asked me how I discovered this – “Did he have a sign on him that said he was Gladdie’s nephew?” he joked. And I explained how Darryl and I had met by chance and discovered we had his Aunt Gladdie in common. Dad nodded. In his world, this kind of coincidence is probably perfectly normal. He knows a lot of people. Dad: Do you take a lot of drives with Mom? Karen: Yes. (I take my late mother on all my drives with me.) But I like taking drives with you, too. Karen: No, but it doesn’t matter. Dad: It doesn’t matter because we’re with each other. Dad: These days it’s just hard getting up the energy to get out of the car. Dad: Thank you for the drive today. Karen: It was fun, wasn’t it? Dad: Yes, I enjoyed it very much. Dad: I love you, too. Every time I go down to visit with Moz (87) and Dad (97) I come back with one stand-out moment. Here’s today’s: I haven’t slept well the last couple nights and was feeling really drowsy. I laid down on the bed in Dad’s room and closed my eyes and… I didn’t fall asleep, exactly, but I went to that half-way place. And then I felt my dad stroking my forehead and I looked up at him, and he said, “I love you.” And that – right there – that puts everything else in perspective, doesn’t it? Love is the one important thing. 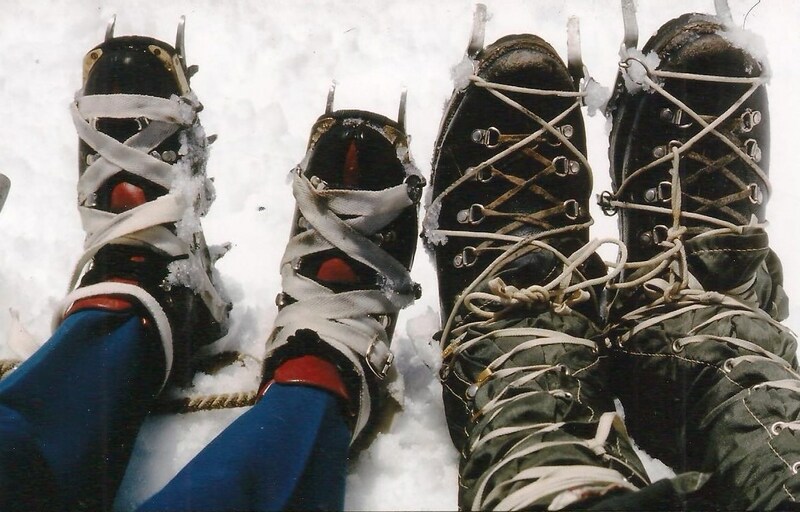 These are my dad’s boots and mine – I think this was taken on our climb of Mount Hood when I was 15.